The balance of trade positions of Australian agriculture and food manufacturing have deteriorated since FTAs with New Zealand, the United States and Thailand have come into play. 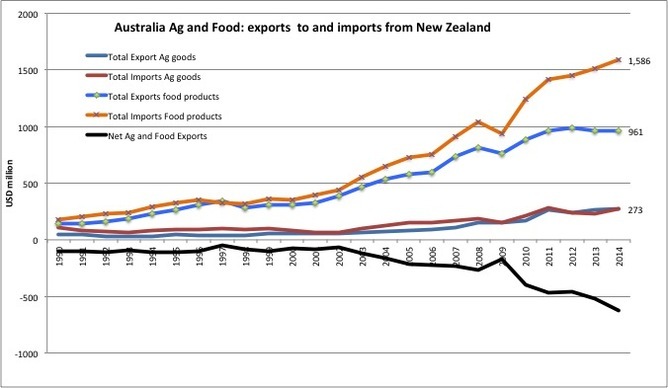 The long-standing 1983 New Zealand arrangement shows growing imports of processed food products, especially since 2000. Australian food exports to New Zealand have levelled off since 2011 with a US$600 million Australian deficit on food products in 2014. Agricultural goods have been close to balance with just over US$270 million of raw or minimally processed product flowing each way. The net result (shown in black) has been a persistent and generally worsening deficit for Australia in its agriculture and food trade with New Zealand for the whole period. The agreement with the United States came into effect in 2005. 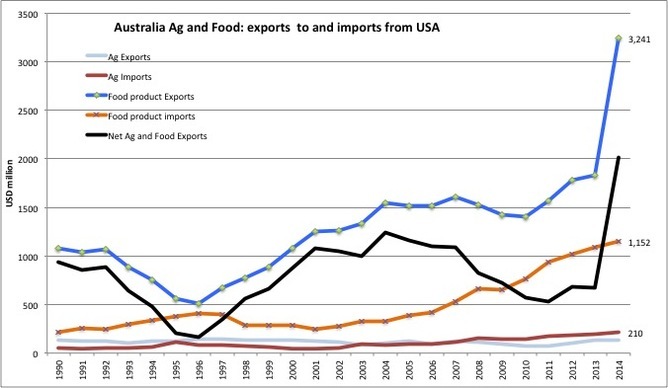 Again agricultural products are close with Australian imports of US$210 million slightly exceeding exports since 2007. 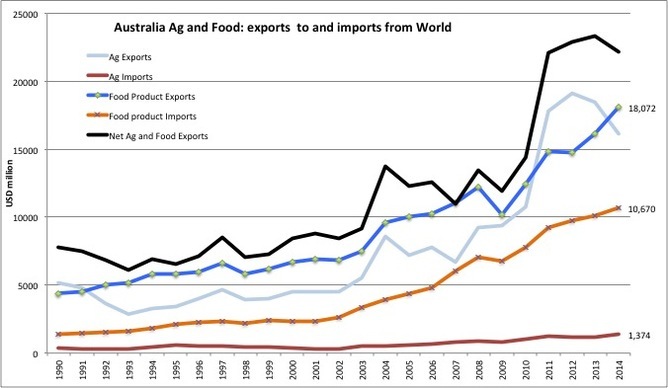 Australian food exports have always exceeded imports but the surplus halved between 2004 and 2013. The basis for the almost doubling of food exports in 2014 is unclear, but meat products driven by beef herd rundown in drought affected Queensland would be part of what may be a one-off spike. The net result (again shown in black) has been a persistent but generally narrowing surplus for Australia in its agriculture and food trade with the US since the FTA came into play. The Australian 2014 surplus of around US$2 billion appears likely to settle back to around US$700 million or less in the years to come. Thailand also signed a bilateral agreement in 2005 and the result has been a generally worsening agriculture and food trade deficit. The rise in Australian food product imports from over US$200 million to more than US$800 million in the decade to 2011 is pronounced, as is the subsequent levelling off. 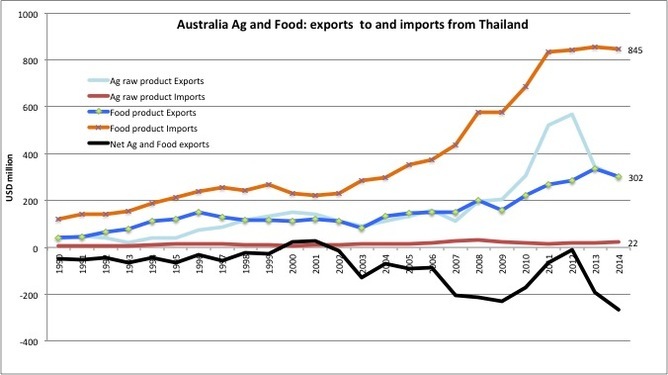 Australian agricultural and food exports to Thailand generally travelled together until 2008 but after this, agricultural exports rose markedly for three years before falling back. The rise and then fall of commodity prices explain much of this hump. Clearly, these three FTAs have failed to deliver. There has been no improvement evident in the agriculture and food trade position under any of the three agreements. Rather, deterioration has been evident in each case. Turning now to the world, Australia’s agriculture and food balance has been a persistent and generally growing surplus. This is the opposite effect. Australian trade performance has been better with non-agreement partners. Again commodity price effects are evident in recent years for agriculture exports. New Zealand, USA and Thailand account for about 30% of the rising food imports but only around 15% of rising food exports to the world. They also account for only around 5% of agricultural exports but 35% of imports. Further analysis can be undertaken, but on these figures, FTA partners have clearly been able to outperform Australian enterprises. On the other hand, where no Agreements have been struck, Australian enterprises have outperformed partners to record a generally improving agriculture and food trade surplus. How might things change with three new North Asian trade, regulation and investment agreements (Japan, Korea and China), and perhaps a Trans-Pacific Partnership? History suggests no necessary gains and trending losses on merchandise trade for both food manufacturing and agricultural industries. It seems we should be more closely monitoring the realities of trade, not fixating on rhetoric and so far empty promises. There is nothing “free” about these trade agreements.